I’m going to be finishing my M.Ed and Student Teaching next year, so I could certainly use a productivity boost. 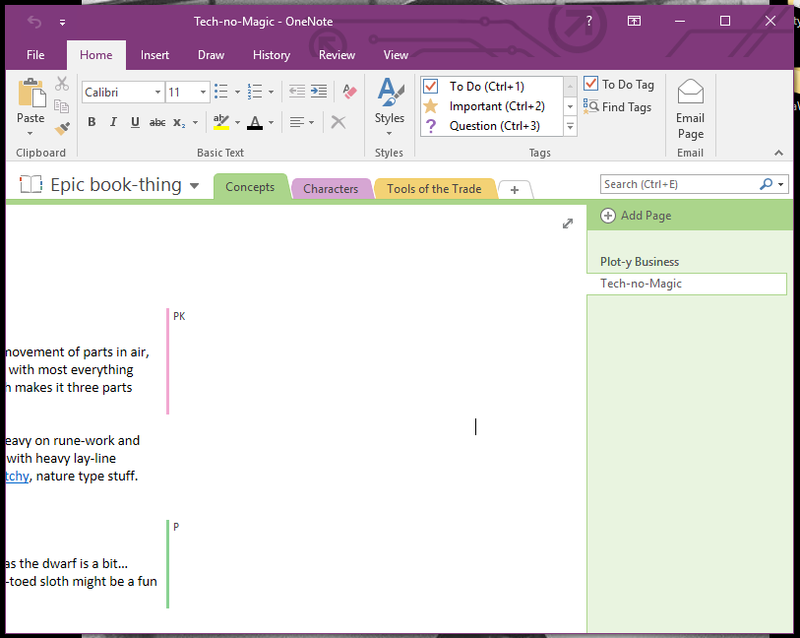 I decided to try OneNote, to see if I could streamline some of my workflow. Did I end up more productive? Yes, and No. Main Book, where quicknotes, and blogs go. Unnamed Novel that my BFF Petra and I are writing. Collection of IDEAS - not ready to be projects yet. 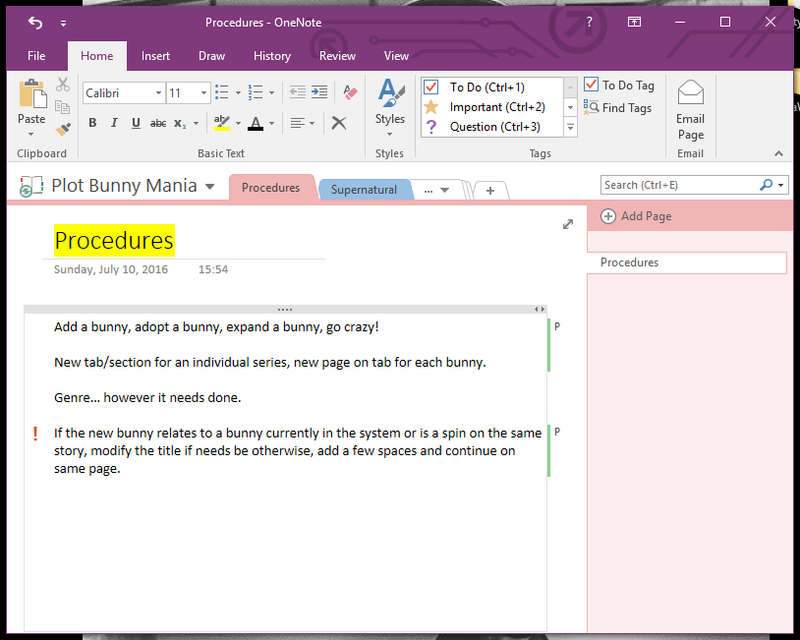 I actually liked using OneNote for work. I put the app on my phone, and I already had it on my desktop & laptop as part of Win10. This was great because I could type notes for project ideas, or reminders while waiting for class to start or in the waiting room at appointments. You can also set it to sync only on WiFi, which is important because I have a small data-plan. I could also work on projects on my laptop at school, that I had started on my desktop at home and the changes sync when I pick-up the project at home again. I also liked not needing to open my docs folder and load different files if I needed to pull from another project, or had an idea for something else while working on an assignment. I have a tendency to work on an assignment until I get hit a wall, change to another assignment or project and work on that until my brain decompresses/gets over a writing block, and then go back to the first assignment. So being able to quickly access things was a plus. As an experiment I started/shared a notebook with my BFF Petra, that we used to work on a writing project. She is currently living in the lower 48 and that makes collaboration hard–especially as we are on different shifts. The nice thing about OneNote, as apposed to trying to work via messenger or a Google doc, is the way projects can be organized. We can make comments/notes in a text pane next to our work, so you can see them at the same time. Additionally, the way notebooks are organized you can have sections for plot/mechanics, character profiles, etc. and then separate pages in those sections–say one for each main character. In Google Docs either it would be a run-on file, or separate files you would need to switch back and forth to. 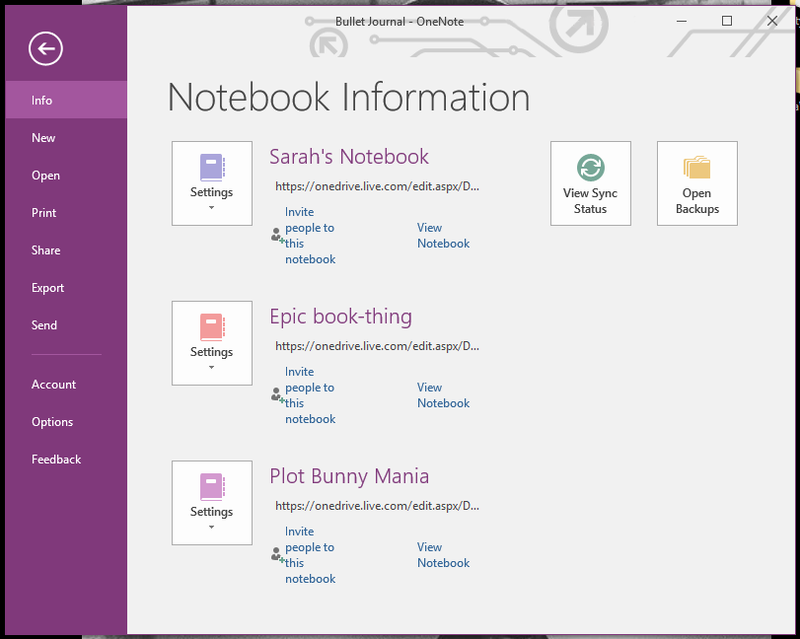 Petra, who was rather skeptical of using OneNote when I started the project, liked it so well for our collaborative work that she opened another notebook to keep track of random ideas we bounce off each other, usually via messenger. Collecting them in one place is nice because you don’t have try scrolling back through weeks of messages, or remember to C/P thoughts into a file. 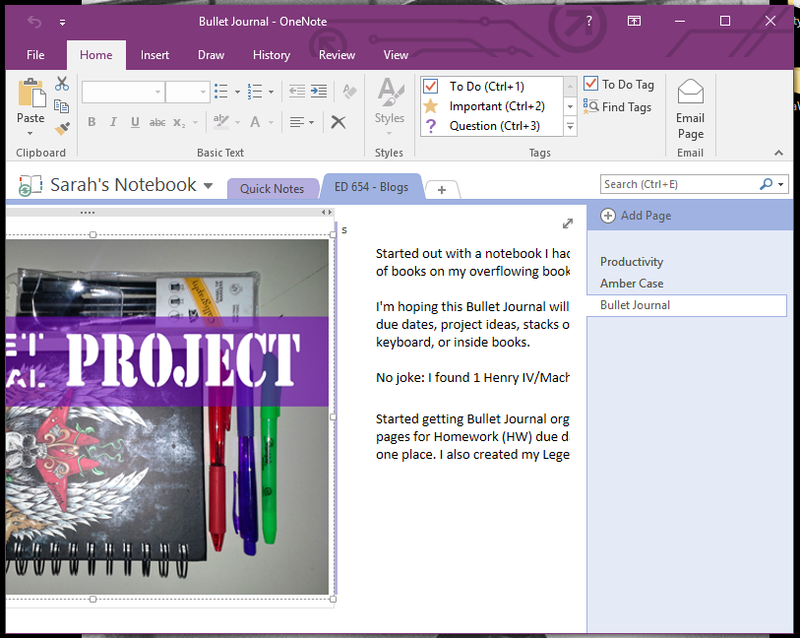 So, I think OneNote did help me become more productive, in that projects are much more organized and I could easily work where-and-when I had time even if I didn’t have my laptop, latest files on a thumb-drive, or a WiFi connection. So, half the reason I was willing to try the OneNote program was because you’re supposed to be able to connect it, with a plugin, to your WordPress site. I’m used to hand-coding my posts–1) because it’s familiar/habit, 2) because it lets me manipulate pieces outside what the visual editor accounts for, and 3) so that I have a copy on my hard drive. I figured creating posts in OneNote would allow me to skip some of the hand-coding, and still give me a back-up copy. The plugin doesn’t work. The directions, in the plugin, are out of date. And, though people have been asking about the connection issue for a year, the developers have not replied at all or fixed the issue. I tried a couple of times to get this to work. Trawled through pages of results, and any variation of the plugin name/issue that I could think of–and, in the end, came up with bupkis. I can’t legitimize spending more than the 3 or so hours I already have on this, so I’m shelving the plugin experiment as FAILED. Thanks for taking the time to try it and share your experiences! I might have to take a look at Evernote sometime, but OneNote works well enough as a collection point and does allow for collaboration so I think I’ll probably stick with it. I’m glad that my productivity experiment went well, and that I could share in case someone else was thinking about changing their workflow.